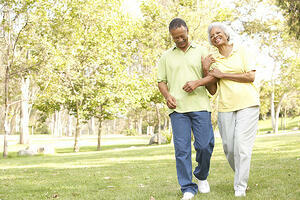 At Daystar Retirement Village, we promote an active lifestyle because we know that movement has so many benefits. Researchers have shown that regular exercise—moving your body—can boost memory, metabolism and, of course, mobility. We think moving should be fun. Eating good food isn’t a chore, and moving your body shouldn’t be either. At the same time, you don’t want to jump into an activity or exercise that could trigger old injuries or create new ones. The goal is to move gently, but regularly. Our facility was designed with safety and mobility in mind. That’s why, in addition to a fitness room, we also offer classes and activities to help people get out and be active. Tai chi is a perfect example of body movement that is low-impact, but high-value. At Daystar, Tai Chi with Steve meets Monday, Wednesday and Friday at 1:30 p.m. With flowing movements and, often, relaxing music, tai chi is a great way to strengthen the body and calm the mind. At the other end of the spectrum is balloon volleyball. Soothing music is replaced with laughter and the thwack of hands slapping balloons. Trying to keep the balloon in the air while sitting in chairs is a great activity for improving balance, reflexes, strength and even cardio function. Plus, it’s fun. Our balloon volleyball class meets at 2 p.m. on Wednesdays. Other planned fitness activities include Morning Stretch at 10:30 a.m. Monday through Friday and strength training at 3:30 on Thursdays. Healthy Steps meets at 10:30 a.m. on Friday. One of the best low-impact activities around is simply going for a walk, and residents of Daystar have abundant opportunities to do just that. Step out of your cottage or apartment , turn one way and you’re minutes from Westwood Village Shopping Center where you can window shop through dozens of retail outlets on your way to a great cup of coffee . Turn the other way and you’ll be headed for the natural beauty of Roxhill Park, the headwaters of Longfellow Creek. Less than a mile away is Faunteroy Park with a network of paths and trails that are perfect for hiking, dog-walking or strolling with a friend. In fact, Daystar residents are less than a mile from several lovely parks, including the gorgeous views of Westcrest Park, Lincoln Park and E.C. Hughes playground. With summer upon us, there is no better time to lace up your shoes and head outdoors for low-impact, high-value movement.